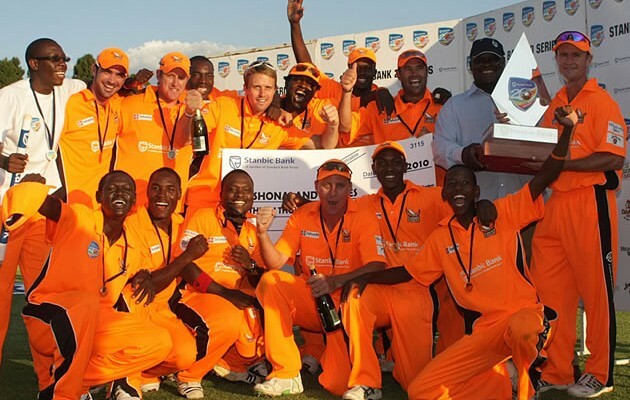 Mashonaland Eagles are the 2015/16 Domestic Twenty20 Competition champions after they edged Mountaineers in a super-over eliminator that decided the thrilling final at Queens Sports Club in Bulawayo yesterday. The match had finished all even, both sides mustering identical totals of 167 for six wickets in their 20 overs. Mountaineers batted first in the one-over eliminator, with Hamilton Masakadza blasting 13 runs while his partner Vusumuzi Sibanda managed three for a tally of 16 off the bowling of Bright Mugochi. Tendai Chatara was given the responsibility to defend the eliminator total, but Cephas Zhuwao flayed the paceman for 17 runs to eclipse the target and hand his Eagles side the championship. Earlier at the same venue, Mid-West Rhinos beat Matabeleland Tuskers by 18 runs in the third-place play-off. Hamilton Masakadza was named player of the tournament on top of landing the competition’s best batsman gong after he scored a total of 455 runs. The 32-year-old national team captain also claimed the award for the most sixes having hit 28 throughout the tournament. For his 10-wicket haul at an economy rate of 7.6, Tiripano received the best bowler accolade.